Aim of this study was to determine the prevalence of avian influenza virus (AIV) subtypes (AIV H9, AIV H7 and AIV H5) in non-vaccinated wild and domesticated bird species across Pakistan. 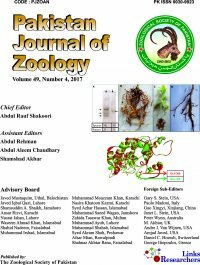 During January-December 2013, in total 700 samples were collected from different species of non-vaccinated birds inhabiting diverse ecological zones of Pakistan. Altogether, 507 tissue and swab samples were screened for the presence of viral RNA by reverse transcriptase polymerase chain reaction (RT-PCR). Same samples were further processed for the isolation of virus by embryonated egg inoculation technique. Moreover, out of 507 samples, 479 serum samples were scrutinized by enzyme linked immunosorbent essay (ELISA). Sero-prevalence of AIV among different species of wild birds was as follows; peacock (n=35; 14%), duck (n=5; 2%), migratory water fowl (n=3; 1%), pheasant (n=2; 0.8%), grey leg goose (n=1; 0.4%), turkey (n=1; 0.4%), eagle (n=1; 0.4%) and crane (n=1; 0.4%), for domesticated bird species sero-prevalence was; broiler (n= 152; 60%), rural poultry (n=14; 6%), domestic desi birds (n=12; 5%), pigeons (n=9; 3.6%), desi chicken (n=9; 3.6%), broiler breeder (n=3; 1%) and layer (n=2; 0.8%). Overall sero-prevalence was 53% and average range of the hemagglutination inhibition (HI) antibody titer (MT log2) against AIV H9 remained 7±3. Real-time PCR results showed 8.3% (42/507) of the samples were positive for viral matrix gene. Sub-typing was performed by specific anti-sera. PCR amplification was done by using N2 specific primers that confirmed 100% of the matrix (M) gene positive isolates as subtype H9N2. This is the first report from Pakistan that confirms prevalence of AIV H9N2 among different bird species across various regions of the country. AIV remains a pandemic threat therefore vigilance for routine AIV surveillance programs and improved vaccination strategies are highly desirable.